Looking for an NYC piano rental company? Whether you need to rent a grand for a day or for a year, get in touch with Piano Movers NYC today. We have several instruments available, including upright and grand piano rental services, and we have over 10 years of experience serving clients in New York, Brooklyn, Staten Island, Manhattan, and the rest of the USA. Even if you just need it for a single event, regardless of the reason, we have the perfect piano for you. Our quotes start as low as $1/day and we accept last-minute calls! In some cases, we even offer a 1-month FREE trial period so that you can try your new piano out. We have several different options available for rent, and we have 10 years of excellent service backing our reputation. Piano Movers NYC strive to make piano rental process stress-free, that is why we accept last-minute inquiries, even on the weekend! Moving a lot? Paino can travel with you wherever you go. 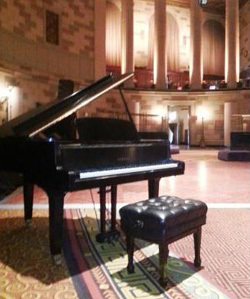 Our upright piano rental rate starts at $29.99/month, and our grand piano rental cost starts at $89.99/month. We know that these instruments can steal your heart, so we even offer a rent-to-own option. That means that your monthly rental fees could be applied to a future piano purchase. In other words, if you are interested in buying the piano after you rent, it is as if you were already starting to buy it slowly. Please contact us to find out more. Whether you are looking for a short-term or long-term rental, the expert team at Piano Movers NYC will transport the instrument for you. We can move any kind of piano into and out of any kind of building, whether there is an elevator or not, and we will place it exactly where you need it to be. Our storage facilities are climate-controlled and dust-free, so you know your instrument will be in-tune and well-kept when you receive it. Our piano rental services extend to New York, Brooklyn, Manhattan, Long Island, and all of the USA. The next time you are looking to rent a piano, contact us and see if we have what you need! Please contact us at any time, including last-minute calls as well as weekends, at (929) 777-5089, or email us at pianony@gmail.com at any convenient for you time.